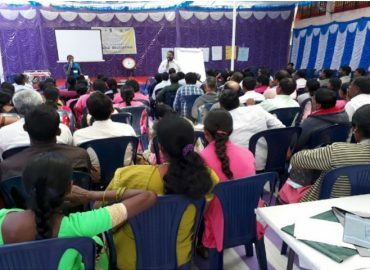 Training of Motivators (ToM) on Community Led Total Sanitation (CLTS) / Community Approaches to Total Sanitation (CATS) has been facilitated by FF in H. D. Kote in Mysore from 26-30 Dec, 2017 for 111 motivators selected by the Block. This workshop was organized by Zila Panchayath, Mysuru, Karnataka and Taluk Panchayath, H. D. Kote. This workshop aimed at creating a critical and sensitive resource pool through building their capacity on CLTS/CATS to augment and accelerate the implementation of SBM (G) in the district.